Net Weight: Packet (20 seeds)5lb (6000 seeds) (+$52)50lbs (60000 seeds) (+$473) This item is currently out of stock! Grown by the early colonists who obtained seed from the Native Americans (pre-1750). 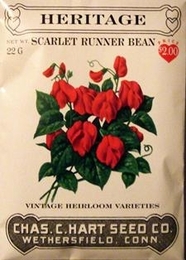 Grown mostly for its brilliant bright red flowers it can be used as a green snap bean or dried shell bean. Large vigorous plants grow 6-8� tall or more and produce clusters of green oval stringless pods. For best flavor and yield pick pods when young (about 4-6� long). For use as shell beans leave on the vines till the pods change color and dry out. Beans prefer warm, dry soil so it is best to wait and plant in late spring. Rough poles of a trellis or fence 8 feet are need for vine support. Cover seeds with 1 inch of soil. Plant 4 to 6 seeds around each pole and thin to 3 to 4 of the strongest plants. Along a fence plant every 4-6 inches and thin to 1 foot apart. Germinates in 6-10 days depending on conditions. Matures in 68 days for snap bean stage and 115 days to dry shell stage.